You are currently browsing the tag archive for the ‘Yogini’ tag. I am a woman who practices Yoga. That’s a simple statement but not always a simple situation to navigate. Despite the social and political victories that women have achieved, the Feminine is still deeply suppressed. I bear witness to this in the hospital, where almost nothing is set up to support a woman in giving birth through her own power. It is only because of the kindness and wisdom of some individual nurses and obstetricians that I and my clients are free to let the birth process, the Life process, express itself and lead the way. And I would say the same dynamic exists in the Yoga world. There are individuals who recognize that connecting to the Feminine, the movement of Life, is necessary for an experience of Yoga but this recognition is just beginning to penetrate the general understanding. So I get my inspiration where I can. And I found a wonderful source of it in the life story of a great Yogini, Yeshe Tsogyal. She was born into a noble family in Tibet in 777 A.D.. Usually the stories of ancient, spiritually gifted people are about men and their lives have been turned into myths that no one can relate to. But this story touched me and it is a woman’s. As a young teenager, Yeshe was brutally raped by her first suitor. She ran away from her second suitor and was placed in the King’s harem. 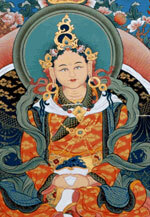 When she was sixteen, she was offered as a consort to the King’s guru, Lord Padmasambhava. He freed her and she became his disciple and then his spiritual heir. One winter, a few years later, she found herself living alone in a cave. Her soul mate and “mystical consort” had left her there because he couldn’t take the cold, having grown up in the milder climate of the Kathmandu valley. It was then that her earlier trauma came back and she came into relationship with her psychological demons. Visions rose up before her in her meditations, full of hideous and terrifying intensity. Hordes of phantoms advanced upon her: fearful, seductive, malign and evil. With these, the products of her own traumatic passions, she wrestled, while remaining unmovable in her vajra-like samadhi, the immutable poise of impartial contemplation. For days the onslaught continued until finally she was left in peace. This was the trial of her final spiritual catharsis. Granted, this is a rather heroic description of her healing process! But the acknowledgment that the demons were a manifestation of her own trauma is insightful, I think. A thousand and a half years ago, women were successfully dealing with the effects of the wounded Masculine. After her horror had passed, the Masculine and Feminine in Yeshe merged and she felt whole. I see women go through this in labour. The pain of opening can ignite your memory of past pain. Because Life is moving so strongly during the birth process though, the opportunity for integration in the present is particularly ripe. The birthing room becomes your cave. But to finish the story, Yeshe and her man got back together and continued to practice Yoga with each other. She travelled all over Tibet with Padmasambhava, her guru, burying texts for the benefit of future generations. When she was twenty- eight, she became a fully enlightened Buddha. It is guessed that she died in her early fifties. As was the case with Yeshe, we don’t have to literally give birth in order to give birth to ourselves. Yoga offers us a way to enter our lives renewed. When demons dance, we can receive them, watch and wait. Link to the site with Yeshe Tsogyal’s story.